Men and women often choose the profession of nursing because they have a calling to help people live healthy lives. Caring for those who are ill and promoting health to local communities are usually the images that come to mind when picturing a nurse. But there is an ugly side to the nursing profession, called lateral violence, that often goes underreported due to fear of retaliation or being ostracized by the "care" team. Media outlets and television shows such as Grey's Anatomy will often portray the condescending physician who is emotionally abusive to the innocent nurse. In actuality, studies show that as many as 46% of nurses have experienced or witnessed nurse-to-nurse violence in the workplace. While most people think of horrific scenes with a disgruntled employee, workplace violence can present in many ways and, at times, be just as destructive. The most obvious of abuse definitions, physical abuse include offenses such as sexual assault, pushing, spitting or hitting. As these behaviors and actions are protected by many federal laws, most facilities and organizations have policies related to "zero tolerance" for violence in the workplace. Physical offenses for nurses most often come from patients who are combative or confused. Regardless of the source, both physical and emotional scars can persist after the incident. Nurses can attend courses such as those through the Crisis Prevention Institute to learn more on how to manage dangerous situations. While slightly less obvious than the physical form, verbal abuse presents itself as berating, making rude comments, or using condescending or loud tones in an attempt to intimidate and/or humiliate someone. Often viewed as a classic doctor-nurse stereotypical interaction, verbal abuse actually occurs more frequently in new graduate nurse vs. experienced nurse interactions and is a widely accepted culture of nurses "eating their young." 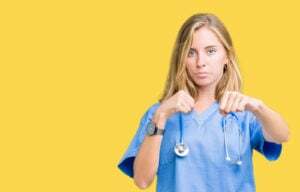 As many nursing specialties, including the Intensive Care Unit (ICU) and the Emergency Department (ED), require personalities that are stronger and more aggressive, seasoned nurses believe that an attitude of cruelty will "toughen" the new nurse. Unfortunately, when the new graduate nurse becomes experienced and is in charge of orienting the next generation of new graduates, the prevailing culture of verbal violence is initiated, thus continuing the cycle of abuse in the department. Learn more about emergency nurses and ICU nurses. The most covert of the abuse standards, psychological abuse can be subtle but powerful and lead to significant emotional distress for those nurses who fall victim. Starting rumors and excluding certain nurses from committees or group events are a few ways nurses use emotional abuse in a unit or organization. This surreptitious form of injustice can be found at the highest levels of the nursing food chain, including nursing academia. Subtly refusing to collaborate with a colleague, withholding critical or important information, or attacking someone's credibility are abusive ways nurses apply lateral violence that is destructive not only to the nurse, but to the organization as a whole when the executive team engages in this behavior. Studies show that a prevalence of lateral violence in the workplace directly affects the patients who fall prey to the units with this infected culture. Due to a lack of effective communication, patients are at significant risk for devastating outcomes when colleagues are fearful to speak up to one another or there is malicious withholding of information occurring in the unit. In addition to adding risk for the patients, lateral violence in a department causes high nurse-turnover rates, depression, and even suicidal behaviors of the nurses who are targeted for this destructive behavior. With sometimes years of cultural ingraining, it can be challenging to even recognize and call out the patterns of abuse. Nursing departments, units and organizations must first acknowledge the presence of lateral violence in order to stop it. Quality and Risk Management departments can track areas where communication incidents are unusually high - a symptom of an abusive environment. Initiating a cultural transformation using programs such as Caring Science or Daring Leadership to promote trust and care for the entire staff is an investment towards improved patient outcomes and staff satisfaction. As in any cancerous state, one must assess the ailment of abuse and treat the cause of the disease, utilizing a zero-tolerance policy in order to get the body of the unit robust and thriving. First and foremost, leaders must model the healthy behaviors they wish to see in the nursing staff.